Bern has been fishing since he was nine years old and has been creating his art for about the same length of time. He is an accomplished artist in a variety of media. His master’s degree is in sculpture but he also is a skilled printmaker, potter, and jeweler. However, his greatest focus is found in his paintings. 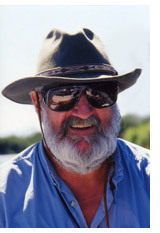 He is particularly noted for his series of fly fishing paintings. His sense of fish, water, and light make them a delight indeed. His favorite fish are the great brown trout in fall spawning colors. Part of his childhood was spent near Indian reservations and the imagery of those days echoes in his series of warriors. He combines historical subjects with highly contemporary renderings, creating a unique body of work. Bern has been featured in newspapers, magazines, and television shows. A limited edition fine art book hand bound in leather titled Bern Sundell://Artist/Fly Fisherman presents a collection of his fishing series spanning most of his career. Bern’s work is held in both private and corporate collections worldwide. His paintings have been shown at the the winter show of the Yellowstone Art Museum for three years in a row. Bern Sundell finds these sites to be particularly useful. Photo Credit to the photographer Gerry Mooney for the image in the banner of Bern painting and the photo of Bern on this page.